Tom Arnold, James Cameron & Schwarzenegger Once Again? Does Tom Arnold really want a True Lies sequel that bad? The NY Times recently published a profile on comedian Tom Arnold, and the very last paragraph of the 3-page article includes this weird quote. "All I know is Jim Cameron's making it and Arnold [Schwarzenegger] and I are going to be in it, and it starts shooting in 14 months, the day after Arnold stops being governor of California… It's not going to be called True Lies II, but it might as well be. I can live with that." What the hell? When did this happen? Apparently he mentioned this on the Howard Stern Show a few months back and it's supposedly just some bullsh*t.
Of course Tom Arnold wants to give his career a huge boost again by working with one of the most beloved directors at the moment, who wouldn't? But that's just it - he's probably hyping this up purely as a way of trying to actually make it happen. Anyone who has talked with James Cameron in the last year knows that not only is he 100% dedicated to Avatar, but that his future is focused on more 3D projects, including another drama, the Heavy Metal ensemble film, or the long-awaited Battle Angel project he's been attached to forever. There's no True Lies 2 that's actually in the works, as far as I've ever heard in the last few years. This almost wasn't even worth mentioning, except that I just think - to be frank - it's a fun story. In theory, who wouldn't love to see True Lies 2? I know that the original is one of Cameron's biggest departures from the usual epic, sci-fi movies he normally makes, but it was hilarious, crazy, and awesome, and I still love it. For now, until we hear more from Cameron, we'll entertain this idea just for the hell of it. Sound good? Update: Harry over at Ain't It Cool News got an email from Cameron addressing this and, as expected, it's pretty much a bunch of BS. "I think Tom was joking. There are no plans for a True Lies 2. I don't know about the creative direction thing… I'm always down for a good action/comedy. But since September 11, I've never felt comfortable generating laughs with nuke-toting Islamic fundamentalist terrorists." Though he does go on to say: "But if we ever do another True Lies, I wouldn't dream of doing it without Tom. He's a good friend and a very funny guy." So there you have it - don't believe any of Tom Arnold's shenanigans! Strangely enough I was just watching this on TBS or was it TNT earlier this evening. Talk about living in the twilight zone. I do remember watching this in the theater when I was really young. Wasnt the best spy movie but it delivered what popcorn movies hould be all about. How can they make a sequel to True Lies when the main characters know of their 'alternate' lives? The whole point of the movie was Arnold leading a double-life, unknown to his wife. Tom Arnold has been screaming sequel for over a decade; I wouldn't listen to him. GIVE ME DA GODDAMN PAGE! I'd pay to see this, I'd like for this to be a true, a non-sequel sequel to True Lies with Cameron and the Arnolds? I'm in. It would be the perfect thing for Arnold Shwarzenegger to do to re-enter the filmmaking game again, to an awesome 3D action comedy with James Cameron... I doubt its going to happen, just as much as I doubt Battle Angel will ever actually happen, sure we keep hearing its on the table, in the cards, but I just don't see it happening, plus I'm not very interested in seeing a Battle Angel movie anyway. Cameron is moving onto the Titanic 3D conversion after Avatar(which he shouldn't be doing, unfortunately a lot of people hate Titanic now, he should convert T2 instead and let the world remember how good a Terminator movie can be) which will take roughly 14 months or so. Then supposedly the day Arnold gets out of office he'll be doing this movie. And by then, I have a feeling the world is going to be wanting to see an Avatar sequel. I knew he would get back into acting after his role was up. how they can make a sequel to True Lies aint True Lies a remake of La Totale and that did not have a sequel. Enjoyed the first one and there was plenty of room to make a sequel I just feel they've left it too long. Just watched true lies last night and it was pretty decent. Bring on a sequel! Does anyone realize that both of these actors are in their LATE 50s/EARLY 60s. WHY THE F would you want to see them in True Lies 2. Don't get me wrong, True Lies is awesome, but lets be realistic here and not do a sequel for the sake of doing one. @ 10 YOU BITE YOUR TONGUE!!!!!!!!!!!!!!!!!!!!! TRUE LIES is hands down one of the greatest action movies every made. It has everything: guns, explosions, a wickedly high body count, comedy, and of course Mrs. Curtis's uber sultry dance in her lingerie. Seriously, I have jerked at least 200 times to that scene! But I digress... Though I truly do love this film, I have to say I am not that excited for a sequel 15 or 16 years later. I mean come on, Aah-nold has been politics for like eight years now, so you know he's a big cream puff by now. I hate to be shallow, but I don't think you're going to be getting a sultry dance out of Jamie Lee these days. Maybe out of the daughter considering how hot she is nowadays, ya know the "Dollhouse" girl. Also, I don't care how good Tom Arnold was in the first one (he basically made the film), but nowadays I think it seriously hurts the credibility of a film by casting him. I think everyone is just excited to see Cameron back in the game after twelve years. But let's just see Avatar and find out for ourselves if this is going to be the big masterpiece everyone says it will be. Then maybe (just MAYBE) we should consider a True Lies II. Psh! 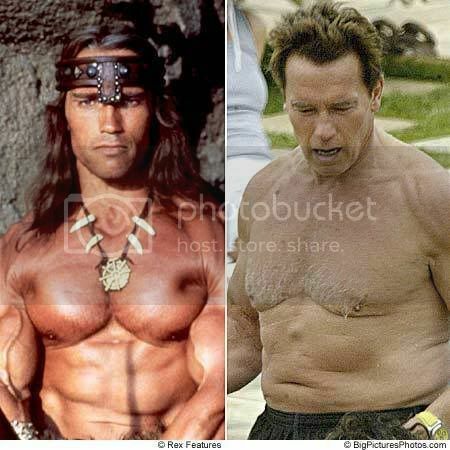 If Stallone can do it, Arnold can do it for sure. *eyes #11* Yeaaaaaa.... Lawl Tom Arnold. Eh, Schwarzenegger is awesome...I would probably see it. #13 Jeez, Sabes. Stop posting right after me all the time! People will think we're the same person with 2 accounts. =P #14 Lol..ew! Well, he is an old man. And he didn't really have to work hard for a role lately. I have no doubt he can get back in shape with discipline. And maybe some lypo and drugs. 😉 Plus, I think Stallone was not nearly as ripped in the latest Rambo as he is in his new movie. Otherwise he would have taken his shirt off at some point to show off his pecks, imo. @5 Tazz...lol what does the original not having a sequel have to do with the remake? what, is it morally wrong to make a sequel of a remake if the original doesn't have one? True Lies is a remake which allows changes and creative freedom...and such changes can be the creation of a sequel. Man i would love to see Arnie back in film!